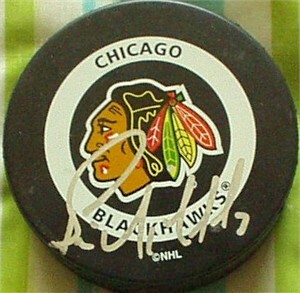 Chicago Blackhawks hockey puck autographed in silver by future Hall of Famer Bernie Nicholls. Obtained in person at celebrity golf tournament. With certificate of authenticity from AutographsForSale.com. ONLY ONE AVAILABLE FOR SALE.